The decade of the 1970s brought a name change and a new studio for the show. 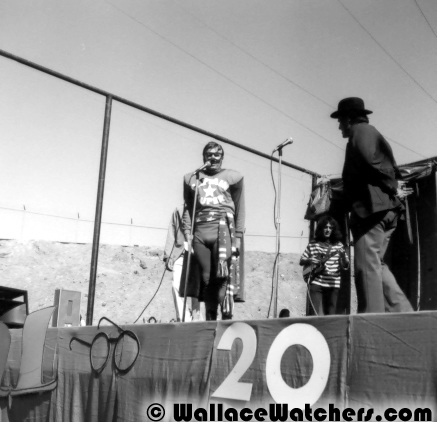 In June of 1970, Wallace and Company changed its name to the Wallace and Ladmo Show. Later in that year, Wallace adopted a derby as part of his costume. Gerald’s hair went from curly lock to the pageboy look. What would The Wallace and Ladmo Show have been without the daily heroic exploits of that devil-may-care flying fool Roger Ramjet? Along with a new show title, a new studio and a new set, the show bought a package of Ramjet cartoons in 1971 and were shown almost daily until the end of the show in 1989. Ramjet was created in 1965 by the Snyder-Koren Studios and never ran on network television. It was created solely as a syndicated cartoon show. Ramjet was voiced by Gary Owens of Rowan and Martin’s Laugh-In fame. 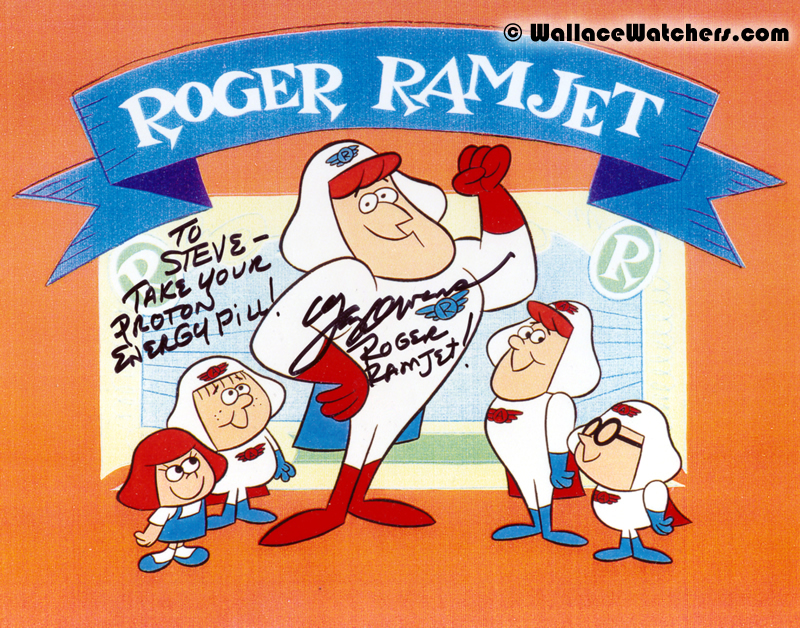 Roger Ramjet was a super-patriotic jet pilot who, with the aid of his American Eagle squadron (Yank, Doodle, Dan and Dee) fought dastardly villains like the evil Noodles Romanoff and his band of No-Goods. Noodles was that man from N.A.S.T.Y. (National Association of Spies, Traitors and Yahoos). Other evil-doers included Red Dog the Pirate (Aye, Ramjets! ), Jacqueline Hyde and, of course, the Solenoid Robots (mmm . . . buzz-click). In 1971, KPHO moved from its studio next to the Westward Ho Hotel to their present location at Interstate 17 and Indian School Road. The set went from a counter with stools to a more elaborate blue and yellow desk with benches and a larger walk-in Time Machine. Also in 1971, Channel 5 experimented with syndicating the show to Los Angeles. KTLA-TV aired pre-filmed segments in the early afternoon. Both the station and many parents in the Los Angeles area complained loudly about the Gerald character. The show did not last long there. Ladmo got another show with Ladmo’s Clubhouse that ran from 8-8:30 a.m. Monday through Friday. Mike Condello would leave the show in 1972 and move to California to pursue his music career. Mike would eventually have his own local cable variety show as well as producing and composing music for different rock artists. He also worked as a casting director. 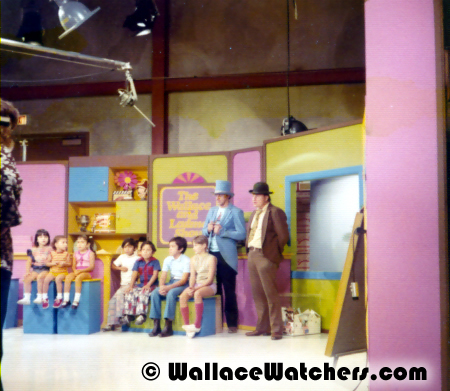 Beginning in September 1973, the Wallace & Ladmo Show is split in half and is aired twice a day, from 8 to 8:30 in the morning and 3:30 to 4 p.m. in the afternoon. On October 1, 1973, the morning broadcast was the first show that was not aired live. It was difficult to get kids to come down to be in the audience that late in the morning, especially during school time. The morning segment was recorded on videotape right after the afternoon live broadcast and shown the next morning. On April 3, 1974, the show celebrated its 20th Anniversary. KPHO ran an anniversary show for what had become the longest-running children’s show in the country. Governor Jack Williams declared April 3 to be Wallace & Ladmo Day. Phoenix Mayor Timothy Barrow proclaimed April 1 through 7 to be Wallace and Ladmo Week. On April 6th and 7th, Legend City held a series of huge stage shows that turn out to be the biggest event in the history of the amusement park. On August 19th, 1974, the show settled on a single daily showing. The split broadcast format ended. The show now aired from 7:30 to 8:30 every morning, and would remain in this time slot for the rest of the 1970's. Richard DeAngelis would become General Manager of KPHO-TV Channel 5 in October of 1978. 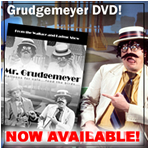 He had been manager for a Meredith station, WNEM-TV in Michigan. 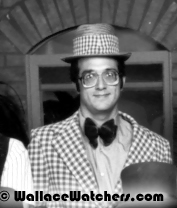 DeAngelis (or Uncle Richard to Gerald) remained at Channel 5 until July of 1992. 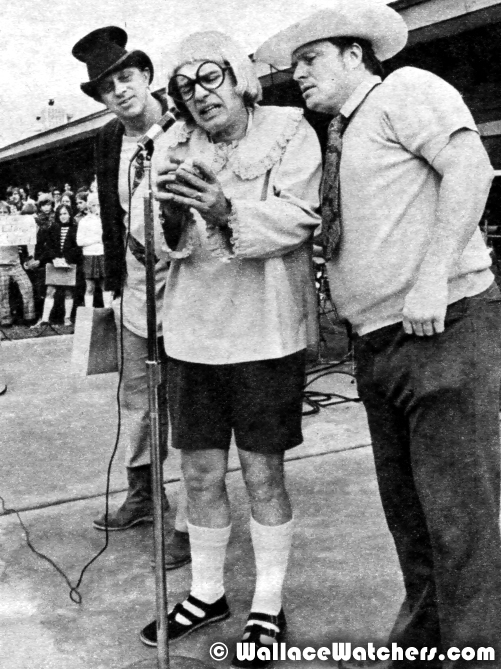 The Wallace and Ladmo Show was a station favorite. It was not only a popular show in the minds of the public but it was a popular show with people at the station. People enjoyed working on the show. There was a tremendous history. 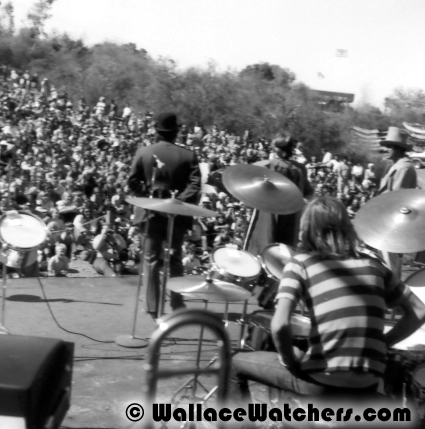 I first became aware of the show in, I believe it was 1969 or 1970, I was sales manager at WNEM at the time and we had a sales meeting at the Biltmore [Hotel in Phoenix]. And I came here and one of the guys from the station took me down to the old Westward Ho and we watched the taping of a Wallace and Ladmo show there. Of course, I didn’t know the guys and they didn’t know me, but it was kind of interesting that some 10-odd years later I was here as a general manager. 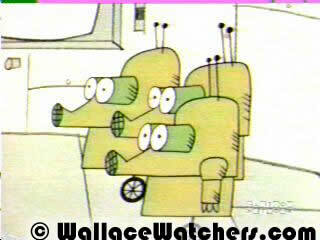 So when I came here, this show [Wallace and Ladmo] was still on the air. The station had to be very careful that any product that was associated with the show was not aired in the show. In other words, you couldn’t have Ladmo plugging a Ladmo product on the show. It would have created a commercial-length program designation for us. Those were the kinds of things that we constantly monitored because it would be very easy, inadvertently, to do something of that nature. I was pleased to have the show on the air. We were proud of the longevity. I really, really appreciated what it was as well as the staff. It was just something exciting for the staff to do. It was a local program other than the typical kind of things that the production people did; the commercials and the in-house promos and whatnot. This was kind of fun and we had a cast of kids every day in the audience. Four o’clock was a very special time around the station. Multi-talented Craig Dingle, who would wind up as producer, writer and artist on the Wallace & Ladmo Show, joined the show in 1978. I was in a class, it was a community college class on, I can’t remember if it was a class on just writing or just performing. They were taking a field trip down to Wallace and Ladmo at Channel Five. We got to go inside and see Wallace and Ladmo. We just kind of putzed around a little bit in there and for some reason to this day, I’m not sure where I got the guts to do it, but I said ‘Can I write some material and submit it to you?’ And Wallace went ‘Sure, go ahead.’ The most surprising this was is I actually did it. I actually sat down and tried to write something. I forgot what it was now, but he liked it enough and called me in and somehow, and it’s all blurry to me now, I just started submitting things. He liked them. This was in 1978. They got on the air. That was a big surprise. The Wizard was the first bit that was on. It was a Thanksgiving bit with jokes about ‘Who’s the favorite team at Thanksgiving? The Los Angeles Yams.’ After that, I just kept submitting and Wallace kept accepting it. It’s really interesting how just time seems to meld for me. It just seems all of a comedy. Not the secret of comedy but one of the secrets. If you just cut everything, all of the excess out. And it just kept going. Then, magically, one day ‘OK, we’re gonna pay ya. Five bucks. Give us so many bits. Five bucks for this.’ That is where I started to grow up. I was not as industrious as I should have been and Wallace let me slide until he finally said ‘Shape up or ship out.’ He didn’t say it that way. He didn’t say it all in that way. I learned a good work habit from Wallace. I got rid of a lot of the things a lot of young people have about they’re special or they’re more special than anybody else, that they can slide and I learned not to slide. It took a couple of years. So I owe Wallace big time for that. They finally made a little corner [for me]. There’s Wallace’s desk and at the side was another desk and I got to sit there and I started to make a mess out of that which always irritated him and rightly so. I just sort of melded into the pot of Wallace, Ladmo and Pat and then Craig’s just kind of moving around in there. I started to make drawings for the background and made bumper cards. Those are the drawings they saw between commercials. I started submitting more and more material. On an average I would submit five bits a week. There’s four or five bits a show. I would submit one per show. For some reason Wallace was not there which was extremely rare, I think Wallace took two vacations in the nine years I was there, then I could do several of the shows. Wallace would write something ahead of time and then I would fill it out. Craig would play several characters such as Dudley Dingle, Mr. Mime, Generic Man and Tubbo the Clown. On November 26th, 1978, NBC broadcast a made-for-TV film called A Fire in the Sky, not to be confused with the 1993 film of the same name about the alleged Travis Walton alien abduction near Heber, Arizona. THIS film concerned an astronomer (Richard Crenna) who discovers that a comet is on a collision course with Phoenix, Arizona. Naturally, no one believes him until it is too late. Landmarks such as the Westward Ho, the Hyatt Regency Hotel and the Civic Plaza crumble as the comet’s explosive shock wave destroys everything in it’s path. The film was shot mostly in Phoenix with scenes also filmed at Kitt Peak Observatory near Tucson. Some local actors were hired for parts. Pat McMahon appeared as the news director for KTAR-12 (the NBC affiliate in Phoenix). He has several scenes with co-star Elizabeth Ashley.